Did you know? This recipe won the famous Pillsbury Bake-Off Contest in 1973. Submitted by Albina Flieller from Floresville, Texas, it takes the taste of classic pecan pie and bakes on top of a flaky crescent crust instead of a traditional pie crust. 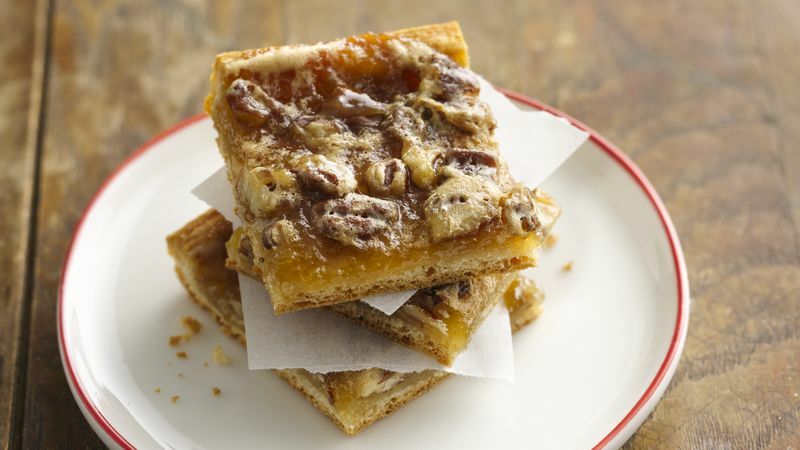 Served in bar form, it’s a super-popular party recipe on Pillsbury.com! Serving pies in bar form is becoming more popular around the holidays in big households or for hosts looking to serve a large amount of people without a lot of effort. This recipe serves 24, rather than the traditional eight servings you’ll find in most regular pie recipes. Crazy about pie? Our how-to article covers all of the pie baking basics plus tips on how to take it beyond basic!